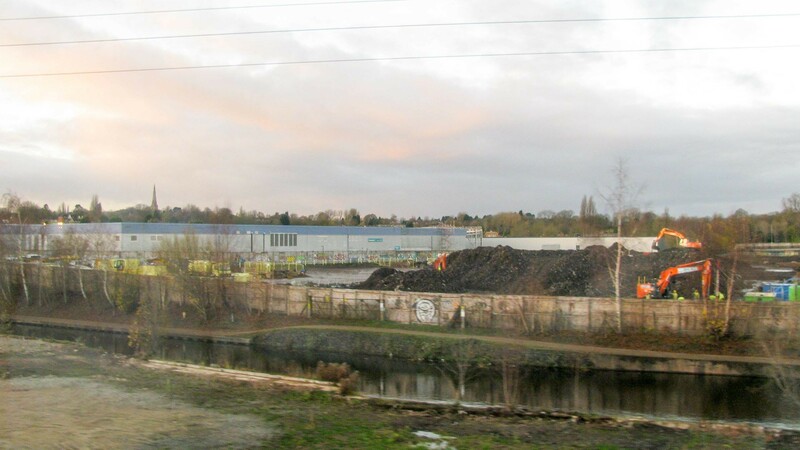 The Dudley No 2 Canal once came through the building site to meet the Worcester & Birmingham Canal near the centre of the photo. The Worcester & Birmingham Canal runs between Birmingham (to the right) and Worcester (to the left). The Lapal Canal is will restore through navigation using approximately the line of the Dudley No 2 Canal. The building works in the photo include creation of the first section of the Lapal Canal as an integral part of the work. The Lapal Canal will run a little further south than the original alignment, nearer to the blue and grey buildings seen in the background.